As an artist, and as someone who always strives to do better, I don’t think there are perfect days at work. There are very creative and productive days, and days that are not productive at all. Of course, the combination of a successful training, with great rehearsals following, great mood and energetic atmosphere would be what is so called ‘a perfect day’. Come artista, e come qualcuno che si sforza sempre di fare meglio, non penso che ci siano giorni perfetti al lavoro. Ci sono giorni molto creativi e produttivi, e giorni che non sono affatto produttivi. Naturalmente, la combinazione di un allenamento di successo, con ottime prove generali, ottimo umore e atmosfera energica sarebbe quella che viene definita una "giornata perfetta". I started dancing because I was restless as a child. My parents tried to make me do all sorts of combat sports, team sports, so called masculine sports… I was very timid and introvert, and I had a hard time letting go of what was inside my head. But I always hated all these contact sports, they were too violent for me, and I would come back home frustrated. But at some point I started Karate, where we learnt combinations of poses (kata), and I really enjoyed it. At that point a friend of my parents told them I should actually dance, because Kata was so similar, so I started dancing and doing gymnastics. I loved the competition with myself and the discipline right away, this performance idea to always go further, physically and mentally, and at last, presenting the work and giving it out to the audience. 2.Cosa ti ha portato a ballare..
Ho iniziato a ballare perché ero irrequieto da bambino. I miei genitori hanno cercato di farmi fare ogni sorta di sport da combattimento, sport di squadra, i cosiddetti sport maschili ... Ero molto timido e introverso, e ho avuto difficoltà a lasciar andare ciò che avevo nella mia testa. Ma odiavo sempre tutti questi sport di contatto, erano troppo violenti per me e tornavo a casa frustrato. Ma ad un certo punto ho iniziato il Karate, dove abbiamo imparato combinazioni di pose (kata), e mi è piaciuto molto. A quel punto un amico dei miei genitori ha detto che dovevo ballare, perché Kata era così simile, così ho iniziato a ballare e fare ginnastica. Ho amato la competizione con me stesso e la disciplina subito, questa idea di performance per andare sempre più lontano, fisicamente e mentalmente, e alla fine, presentare il lavoro e distribuirlo al pubblico. 3.If you would be able to wake up tomorrow with a new talent, which one would you choose? I think I would like to wake up with the ability to speak as a great orator, quite boring I have to say. Often, dancers are great at expressing themselves with their bodies, but I feel like it is always a bit hard to put things together with words. Not that I lack intelligence, but more because my head is a constant flow of ideas, which is for me easier to translate with my body. So whenever I try to explain what I do, it requires a lot of care and sometimes my words are not the ones which express my feelings the best. Also, I would like to have that talent to be able to reach out to more audiences. Dance is sometimes an art which people fear or misunderstand because there is this ‘silence’ rule. And even outside of the performance space, many artists still think that they do not need to explain their artistic choices, which places contemporary dance on a pedestal very hard to reach for the audiences that are not used to watch it. Also, in a way, the human voice has this natural higher powers, yet we are very uncomfortable with the idea of speaking in front of others, whether it concerns a performer, or an audience member. I think speech can bring peace as much as it can start a war, yet it makes us cry when we hear beautiful songs, laugh when we hear funny noises... and I would like to incorporate that into what I do, in order to heal people, make them feel and think, while bringing them into my world with my dance. 3. Se potessi svegliarti domani con una nuova dote, quale sceglieresti? Penso che mi piacerebbe svegliarmi con la capacità di parlare come un grande oratore, abbastanza noioso che devo dire. Spesso, i ballerini sono grandi nell'esprimere se stessi con i loro corpi, ma sento come se fosse sempre un po 'difficile mettere insieme le cose con le parole. Non che manchi di intelligenza, ma più perché la mia testa è un flusso costante di idee, che per me è più facile da tradurre con il mio corpo. Quindi ogni volta che cerco di spiegare quello che faccio, richiede molta cura e talvolta le mie parole non sono quelle che esprimono i miei sentimenti al meglio. Inoltre, mi piacerebbe che quel talento fosse in grado di raggiungere un maggior numero di spettatori. La danza è a volte un'arte che la gente teme o fraintende perché c'è questa regola del "silenzio". E anche al di fuori dello spazio scenico, molti artisti pensano ancora che non abbiano bisogno di spiegare le loro scelte artistiche, il che pone la danza contemporanea su un piedistallo molto difficile da raggiungere per il pubblico che non è abituato a guardarlo. Inoltre, in un certo senso, la voce umana ha questi naturali poteri superiori, eppure siamo a disagio nell'idea di parlare di fronte agli altri, sia che si tratti di un artista o di un membro del pubblico. Penso che il discorso possa portare la pace tanto quanto può iniziare una guerra, ma ci fa piangere quando ascoltiamo canzoni bellissime, ridiamo quando ascoltiamo rumori divertenti ... e vorrei incorporarlo in quello che faccio, al fine di guarire le persone, farle sentire e pensare, mentre le porto nel mio mondo con la mia danza. 4. Who are you most grateful for your artistic passion? There are so many people I look up to and who inspire me on a daily basis.! Many artists like Marina Abrahamovic, Natalia Horecna, Gelsey Kirkland, Max Richter, Jacopo Godani… Artists who have a voice for themselves and are not afraid to speak out the ugly truths, to dare to change opinions and to present new kind of performances. But this is just a very short list. It’s going to sound very ‘cliché’, but I think I am most grateful towards my parents for my artistic passion. I come from a rural place, it’s the countryside, people sometimes are not very open-minded and very conservative. But my parents always supported me, they taught me humility, passion, determination, hard work. They taught me to ignore the hurtful words thrown at me, to digest them and see them as a sign of weakness for people who had poor ambitions. They made me who I am today. The fact that dance made me perfectionist and eager to go even further is just an extension of that. My parents really taught me to stay open minded and accept all the possibilities life has to bring you, and that’s a beautiful philosophy which as a result had me strive for my artistic passions. 4. A Chi sei più grato per la tua passione artistica? Ci sono così tante persone che guardo e che mi ispirano ogni giorno.! Molti artisti come Marina Abrahamovic, Natalia Horecna, Gelsey Kirkland, Max Richter, Jacopo Godani ... Artisti che hanno una voce per se stessi e non hanno paura di pronunciare le brutte verità, di osare cambiare opinione e presentare nuovi tipi di spettacoli. Ma questa è solo una lista molto breve. Sembrerà molto "cliché", ma penso di essere molto grato ai miei genitori per la mia passione artistica. Vengo da un luogo rurale, è la campagna, le persone a volte non sono molto aperte e molto conservatrici. Ma i miei genitori mi hanno sempre supportato, mi hanno insegnato umiltà, passione, determinazione, duro lavoro. Mi hanno insegnato a ignorare le parole offensive gettate su di me, per digerirle e vederle come un segno di debolezza per le persone che avevano pessime ambizioni. Mi hanno reso quello che sono oggi. Il fatto che la danza mi abbia reso perfezionista e desideroso di andare oltre è solo un'estensione di ciò. I miei genitori mi hanno davvero insegnato a rimanere aperto e ad accettare tutte le possibilità che la vita deve offrirti, ed è una bella filosofia che mi ha spinto a conseguire le mie passioni artistiche. 5.Would you change something in the dance world from where you formed yourself? Yes. Many things, but unfortunately we live in a time in which such things are not said out loud. So for now I would just say that I would change the idea people have about training/performing. We have this big performance culture going on at the moment, and it , in which you have to be strong (in your head and your body) to become a strong athlete, therefore a strong artist, make the best out of every minute performing, which often involves treating your body in a bad way, such as training too much, too hard, without any physical therapy follow up, without even knowledge of what happens in your body when you dance. And this is very sad, because dancers break themselves working like that, especially young kids who are talented beyond any artistic levels and who can’t keep going as they break their bodies way too early. It also comes with a psychological effect. Dancers tend to think that if they don’t reach exhaustion during a performance they didn’t do well which is a source of frustration. But it is also for in my opinion a reason why many dancers feel like they can’t do anything else, or have to restrict themselves to dance all day, without exploring other things in life. I myself went through that. I dealt with never being happy with what I was doing, because it was making me think that I was not good enough, because of comments I had received regarding my training and/or performances… And the problem is that it takes a really long time to then get rid of habits such as getting frustrated and angry at myself. It can really take you down, physically and mentally, to the point that you forget why you wake up in the morning. This is my idea of new ways of moving, on top of combining new approaches to mixing genres and styles. I very much want to break down this culture of muscular dance, and that I thank Jacopo Godani, who gave me glimpses of a repertoire in which everything was effortless and well thought. Where I was formed, and where I kept on forming myself, I saw way too many kids getting a hip replacement, or a knee/ankle/back surgery… Because they were working in a wrong way, and were encouraged also to keep going like that. In general, I feel that what I just talked about has to do with kindness. Dancers and their supervisors tend to forget that dance is made of generosity, gratitude and love. They forget to allow themselves to be kind to each other and with themselves. As a professional ballet dancer, one of my teacher and friend always asked me why I was angry when I couldn’t perform something properly, she was the one to remind me that dance is just dance, it’s just a beautiful passion, it’s just doing what you love all day long. Kindness starts as you wake up in the morning, and its keeps going through the day, whether you’re training, rehearsing, or performing. You can always go further in what you do, without killing your body and your brain. 5.Cambieresti qualcosa nel mondo della danza da dove ti sei formato? Sì. Molte cose, ma sfortunatamente viviamo in un periodo in cui tali cose non vengono dette ad alta voce. Quindi per ora vorrei solo dire che cambierei l'idea che le persone hanno sull'allenamento / esecuzione. Abbiamo questa grande cultura della performance in corso al momento, e in cui devi essere forte (nella tua testa e nel tuo corpo) per diventare un atleta forte, quindi un artista forte, sfruttare al meglio ogni minuto esibendosi, che spesso comporta il trattamento del tuo corpo in modo brutto, come allenarsi troppo, troppo duro, senza alcun seguito di terapia fisica, senza nemmeno sapere cosa succede nel tuo corpo quando balli. E questo è molto triste, perché i ballerini si rompono lavorando in quel modo, specialmente i ragazzini che hanno talento oltre ogni livello artistico e che non possono andare avanti mentre si spezzano i loro corpi troppo presto. Inoltre ha un effetto psicologico. I ballerini tendono a pensare che se non raggiungono l'esaurimento durante una performance non hanno fatto bene, il che è fonte di frustrazione. Ma è anche a mio avviso una ragione per cui molti ballerini sentono di non poter fare altro, o devono limitarsi a ballare tutto il giorno, senza esplorare altre cose nella vita. Io stesso l'ho passato. Mi sono occupato di non essere mai contento di quello che stavo facendo, perché mi faceva pensare che non ero abbastanza bravo, a causa dei commenti che avevo ricevuto riguardo al mio allenamento e / o alle esibizioni ... E il problema è che ci vuole molto tempo per poi sbarazzarsi di abitudini come sentirsi frustrati e arrabbiati con me stesso. Può davvero abbatterti, fisicamente e mentalmente, al punto che ti dimentichi perché ti svegli al mattino. Questa è la mia idea di nuovi modi di muoversi, oltre a combinare nuovi approcci per mescolare generi e stili. Voglio davvero abbattere questa cultura della danza muscolare, e ringrazio Jacopo Godani, che mi ha fatto intravedere un repertorio in cui tutto era senza sforzo e ben pensato. Dove mi sono formato, e dove ho continuato a formarmi, ho visto troppi bambini ottenere una protesi d'anca, o un ginocchio / caviglia / chirurgia alla schiena ... Perché stavano lavorando in un modo sbagliato, e sono stati incoraggiati anche a continuare ad andare come quella. In generale, sento che ciò di cui ho appena parlato ha a che fare con la gentilezza. I ballerini e i loro supervisori tendono a dimenticare che la danza è fatta di generosità, gratitudine e amore. Si dimenticano di permettersi di essere gentili tra loro e con se stessi. Come ballerina professionista, una mia insegnante e amica mi ha sempre chiesto perché ero arrabbiato quando non ero in grado di eseguire qualcosa correttamente, era lei a ricordarmi che la danza è solo danza, è solo una bella passione, è solo fare ciò che ami tutto il giorno La gentilezza inizia mentre ti alzi al mattino, e continua a scorrere per tutto il giorno, sia che ti alleni, provi o ti esibisci. Puoi sempre andare più lontano in quello che fai, senza uccidere il tuo corpo e il tuo cervello. 6. 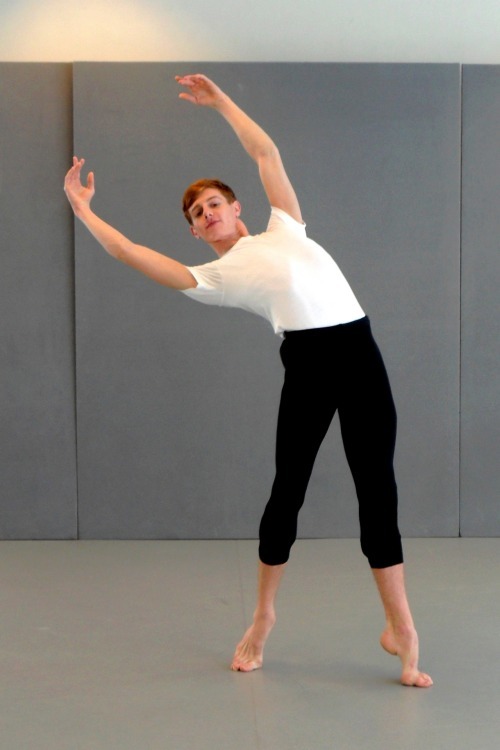 Is there room for innovative young dancers in your country or abroad? I think I can positively and happily say Yes! Everywhere I have been I have met gifted young dancers who were encouraged to be creative and present their work. I myself have had the chance to do so in Finland, whether it was a the Finnish National Opera (where I worked for 5 years) of with other institutions. I was always given me an opportunity to present my work onstage whenever it was possible. At the same time, I graduated from the Hamburg Ballet School, school to John Neumeier’s company, where students were very much encouraged to create, which was a direct reflection of what happened in the company, and in most german dance companies: people who have the need to express themselves are given a chance by their artistic directors, it is a european mentality that I hope will strive and become more important. But now back to my country (Finland), I will present 2 new projects within 2 months time, and I’m so grateful that finnish people are so reactive and ready to welcome new artists and new styles. I think the finnish audience is very eager to discover new things and I love that. I never heard any bad critics about what I had to propose, even the people who didn’t understand my concepts and views always tried to be constructive and positive about what they saw. Of course, “room for innovative young dancer” doesn’t always come with the financial aspect of things, whether it is in my own country or abroad. Curators, directors and such are always very hesitant to give out paying chances, but I also understand that. Nowadays, there is a lot of art, not everything is good, and art institutions can see their budgets lower and lower. But as long as I am happy and can afford a shelter and food for myself, things are going just great. 6.C'è posto per giovani danzatori innovativi nel tuo paese o all'estero? Penso di poter dire positivamente e felicemente Sì! Ovunque sono stato, ho incontrato danzatori giovani dotati che sono stati incoraggiati a essere creativi e presentare il loro lavoro. Io stesso ho avuto la possibilità di farlo in Finlandia, sia che si trattasse dell'opera nazionale finlandese (dove ho lavorato per 5 anni) con altre istituzioni. Mi è sempre stata data l'opportunità di presentare il mio lavoro sul palco ogni volta che fosse possibile. Allo stesso tempo, mi sono diplomato alla Hamburg Ballet School, scuola della compagnia di John Neumeier, dove gli studenti erano molto incoraggiati a creare, il che era un riflesso diretto di ciò che accadeva nell'azienda e nella maggior parte delle compagnie di danza tedesche: persone che hanno la necessità di esprimersi è data dai loro direttori artistici, è una mentalità europea che spero possa sforzarsi e diventare più importante. Ma ora tornerò nel mio paese (Finlandia), presenterò 2 nuovi progetti entro 2 mesi, e sono così grato che le persone finlandesi sono così reattive e pronte ad accogliere nuovi artisti e nuovi stili. Penso che il pubblico finlandese sia molto desideroso di scoprire nuove cose e lo adoro. Non ho mai sentito cattivi critici su ciò che dovevo proporre, anche le persone che non capivano i miei concetti e punti di vista cercavano sempre di essere costruttivi e positivi riguardo a ciò che vedevano. Certamente, "la stanza per un giovane danzatore innovativo" non viene sempre con l'aspetto finanziario delle cose, sia nel mio paese che all'estero. Curatori, registi e simili sono sempre molto riluttanti a rinunciare alle possibilità di pagare, ma lo capisco anche io. Oggigiorno, c'è molta arte, non tutto è buono, e le istituzioni d'arte possono vedere i loro budget sempre più in basso. Ma finché sono felice e posso permettermi un riparo e cibo per me stesso, le cose stanno andando alla grande. 7.Is there something you dreamed about and you have not done it yet? There are many things I dreamt about and hope to realize some day in the future. I do feel like I have accomplished all my dreams already. I traveled to so many places, met so many beautiful artists and people. I got to choreograph for big stages, take my creations on tour. I work for ballet companies as a corps de ballet and danced as a principal. I worked for huge art festivals which I admired ever since I was a little kid. So I feel blessed with what I have already in my suitcase. If things were to stop tomorrow, I would in a way leave with a feeling of accomplishment. There are still things I would like to do though. Because apart from dancing and choreographing, I love managing arts as well as assisting other artists, and I like especially to take care of projects happening in fields different than mine. I also enjoy bringing new ways of looking at movement, for example in fashion and photography, my eye is always appreciated to make up new interesting visual creations. I like to organize and take care of artists, to guild them also, so I hope to take my turn one day by helping young artists, or artists from abroad into making their projects possible as well. Other than that, I dream to travel the world to discover new cultures and share mine. I have already started to do so, but I hope it will just keep going and that my trips will take me further in space and time. 7. C'è qualcosa che hai sognato e non l'hai ancora fatto? Ci sono molte cose che ho sognato e spero di realizzare un giorno in futuro. Mi sento come se avessi già realizzato tutti i miei sogni. Ho viaggiato in così tanti posti, ho incontrato tanti artisti e persone meravigliose. Ho potuto coreografare per grandi palcoscenici, portare le mie creazioni in tour. Lavoro per compagnie di balletto come corpo di ballo e balla come preside. Ho lavorato per grandi festival d'arte che ammiro sin da quando ero un bambino. Quindi mi sento benedetto con quello che ho già nella mia valigia. Se le cose dovessero fermarsi domani, in un certo senso andrei via con un sentimento di soddisfazione. Ci sono ancora cose che vorrei fare però. Perché oltre a ballare e coreografare, amo gestire le arti e aiutare altri artisti, e mi piace soprattutto occuparmi di progetti che accadono in campi diversi dai miei. Mi piace anche portare nuovi modi di guardare al movimento, ad esempio nella moda e nella fotografia, il mio occhio è sempre apprezzato per creare nuove interessanti creazioni visive. Mi piace organizzare e prendermi cura degli artisti, anche per crearli, quindi spero di poter fare un turno a loro volta aiutando giovani artisti o artisti dall'estero a rendere possibili i loro progetti. Oltre a questo, sogno di viaggiare per il mondo per scoprire nuove culture e condividere le mie. Ho già iniziato a farlo, ma spero che continui e che i miei viaggi mi portino più lontano nello spazio e nel tempo. 8.Four questions in one, your favorite book ... your favorite movie ... your favorite show ... your favorite song ..
Book: ‘Walk through walls’, Marina Abrahamovic; psychological breakthrough. Movie: ‘Three billboards outside Ebbing, Missouri’, Martin McDonagh; daring, inspiring, love. Show: there are too many contemporary shows I would stop sleeping just to watch over and over, but I will quote a classic: ‘La Bayadere’, N.Makarova, if not for the dancing, at least for the music, it is exquisite. Song: something that just came out, fun but serious, and travelled all over Europe: ‘Toy’ by Netta. 8.Quattro domande in una, il tuo libro preferito ... il tuo film preferito ... il tuo spettacolo preferito ... la tua canzone preferita ..
Libro: 'Walk through walls', Marina Abrahamovic; svolta psicologica. Film: "Tre cartelloni pubblicitari fuori da Ebbing, nel Missouri", Martin McDonagh; audace, stimolante, amore. Show: ci sono troppi spettacoli contemporanei, vorrei smettere di dormire solo per vedere e rivedere, ma citerò un classico: "La Bayadere", N.Makarova, se non fosse per la danza, almeno per la musica, è squisito . Canzone: qualcosa che è appena uscito, divertente ma serio, e ha viaggiato in tutta Europa: "Toy" di Netta. 9.What is too serious to make fun of? In a perfect world I would answer nothing. Life is just a big game and nothing is too serious to be made fun of, as long as it remains on a comical path and doesn’t turn into anything else hurtful for anyone. However, I would like to say ‘Personal choices’. These are too serious to be made fun of. Today, everyone allow themselves to comment on other people’s lives and their choices, and it really gets to me. We should all know our place and we should stay respectful towards one another, otherwise we are just running towards our end. People live at their own level in life, unlike the western general concept of equality, we are very much unequal within our own so called developed societies, which means we all have to deal with different physical or mental things that either takes us up or bring us down. So when it is the time to make a choice, it regards only the person who made this or that decision, others don’t have a word to say if they don’t or can’t understand the situation. Helping the person directly concerned by lifting things to a comical level is always great, but gossiping about it, it is very spiteful. 9.Cosa è troppo serio per prendere in giro? In un mondo perfetto non risponderei a nulla. La vita è solo un grande gioco e nulla è troppo serio per essere preso in giro, fintanto che rimane su un percorso comico e non si trasforma in qualcos'altro dannoso per nessuno. Tuttavia, vorrei dire "scelte personali". Sono troppo seri per essere presi in giro. Oggi, tutti si permettono di commentare la vita delle altre persone e le loro scelte, e mi arriva davvero. Dovremmo tutti conoscere il nostro posto e dovremmo essere rispettosi gli uni verso gli altri, altrimenti corriamo verso la nostra fine. Le persone vivono al loro stesso livello nella vita, a differenza del concetto generale di uguaglianza occidentale, siamo molto diseguali all'interno delle nostre cosiddette società sviluppate, il che significa che dobbiamo tutti fare i conti con diverse cose fisiche o mentali che ci portano o portano noi giù. Quindi, quando è il momento di fare una scelta, riguarda solo la persona che ha preso questa o quella decisione, altri non hanno una parola da dire se non lo fanno o non riescono a capire la situazione. Aiutare la persona direttamente interessata a sollevare le cose a livello comico è sempre una grande cosa, ma a spettegolare su questo, è molto dispettoso. 10.What are your next commitments? My next commitments are made of many fun things. Overall it involves creation, I’m premiering my first 20 minutes solo performance: ‘M25: story of a performance’ (note the ‘performance’ haha) in august at the ‘Let’s dance’ Festival in Helsinki. In the winter 2018 I will work with amazing choreographer Virpi Pahkinen in Stockholm on her new piece ‘Monolit polygon’. I will choreograph, of course, because it is the thing I love doing the most, putting movement, costumes and light together. I am also working on establishing properly a way to enter my style as rapidly and efficiently as possible for other dancers, and I’m working with students a lot, because in my opinion a good choreographer is someone who can be understood by anyone and transmit his/her vocabulary to all dancers, not simply for and to principal dancers. So there are also teaching projects with various institutions around Europe coming up, but you’ll have to stay tuned to follow that up. 10.Quali sono i tuoi prossimi impegni? I miei prossimi impegni sono fatti di molte cose divertenti. Complessivamente si tratta di creazione, sto proiettando in anteprima i miei primi 20 minuti di performance solista: "M25: storia di una performance" (si noti la "performance" haha) in agosto al Festival "Let's dance" di Helsinki. Nell'inverno del 2018 lavorerò con il sorprendente coreografo Virpi Pahkinen a Stoccolma sul suo nuovo pezzo 'Monolit polygon'. Farò coreografie, ovviamente, perché è la cosa che amo di più, mettendo insieme movimento, costumi e luce. Sto anche lavorando per stabilire correttamente un modo per entrare nel mio stile il più rapidamente ed efficientemente possibile per altri ballerini, e sto lavorando molto con gli studenti, perché secondo me un buon coreografo è qualcuno che può essere compreso da chiunque e trasmettere il suo vocabolario a tutti i ballerini, non semplicemente per e ai principali ballerini. Quindi ci sono anche progetti di insegnamento con varie istituzioni in giro per l'Europa, ma dovrai rimanere sintonizzato per seguirlo.